The compact Alen BreatheSmart FIT50 Customizable Air Purifier with HEPA-Pure Filter for Allergies & Dust is designed to fit easily in your home, being 30% smaller than Alen’s standard BreatheSmart, and is suitable for cleaning the air in rooms up to 800 sq ft. The Alen BreatheSmart FIT50 Air Purifier is ideal for allergy and asthma sufferers – it comes with a HEPA-Pure filter that effectively removes airborne allergens from your home, including dust, pollen, pet dander, and mold spores, to give you cleaner fresher indoor air. 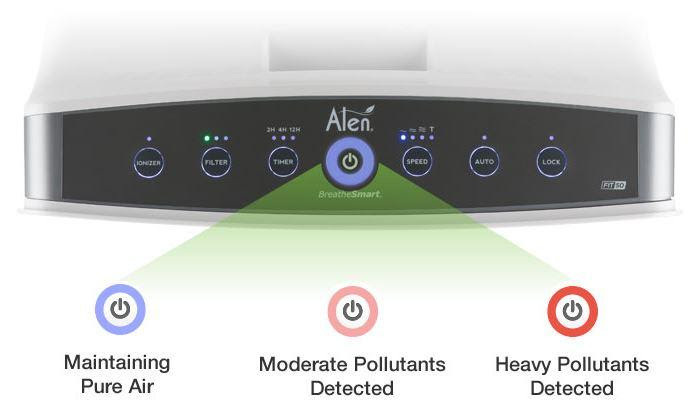 The Alen BreatheSmart FIT50 Customizable Air Purifier is also compatible with a range of optional filters which you can swap out depending on your household’s needs including: HEPA-FreshPlus Filter suitable for Chemicals/VOCs and Odor; HEPA-Silver Filter suitable for Germs and Bacteria; HEPA-OdorCell Filter suitable for Smoke and Heavy Odor. All these filters are available separately and include Alen’s Pre-Filter. 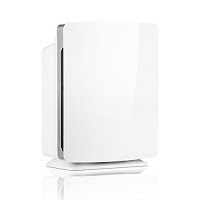 The Alen BreatheSmart FIT50 Air Purifier combines powerful air cleaning with quiet operation. Based on airflow and noise measurements on other air purifiers of comparable size, the BreatheSmart FIT50 is 50% more efficient, 50% less noisy and offers up to 5x more room coverage. The Alen BreatheSmart FIT50 features intuitive technology including SmartSensor, Auto Feature, Air Quality Indicator, Smart Filter Timer, and WhisperMax technology that eliminates irritating high frequency sound so you can even use the Air Purifier at night without disturbing your sleep. Being a smaller unit, the noise levels on the Alen BreatheSmart FIT50 are lower than on the BreatheSmart’s standard air purifier, with the lowest speed at 32.4 dB and the highest speed (Turbo) at 48.7 dB. The Alen BreatheSmart FIT50’s SmartSensor feature automatically detects changing air quality and adjusts the unit accordingly. This helps to prolong the filter life and conserve energy to save you money. There are 4 speeds in total which you can change manually or let the intelligent sensor in Auto Mode do the work for you – it consistently evaluates the environment and adjusts the speed higher or lower as well as auto changing the color of the Air Quality Indicator light to show when pollutants are detected. The Alen BreatheSmart FIT50 Air Purifier features a straightforward and easy to use control panel which also includes a Smart Filter Timer so you can truly maximize the life of the filter. The filter has a life of up to 18 months (depending on usage) before it needs replacing. The Alen BreatheSmart FIT50 Customizable Air Purifier is available in a wide choice of designer panel options/textures/colors (13 to choose from!) so you’re sure to find one that blends in with your home! Designs include white, petal pink, electric blue, pearl blue, brushed stainless, espresso, brushed bronze, maple, oak, rosewood, green, gray, or black. 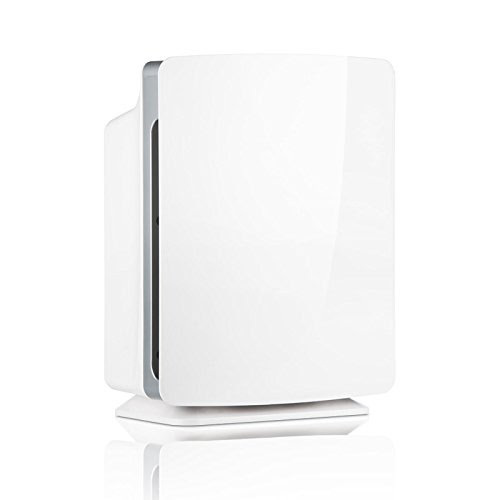 More efficient, less noisy & more room coverage than comparable-sized air purifiers. For peace of mind, you’ll be pleased to know that the Alen BreatheSmart FIT50 Air Purifier is Energy Star Certified (60 watts on highest speed) and comes with a manufacturer’s Lifetime Limited Warranty.